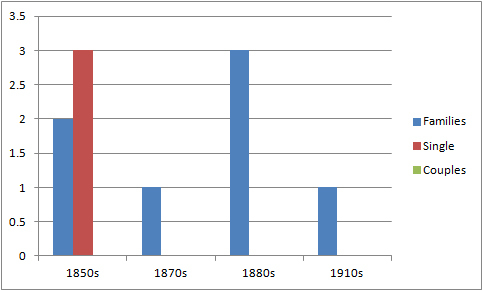 This entry was posted in Migration history and tagged graphs, migration statistics by cassmob. Bookmark the permalink. What a great idea! 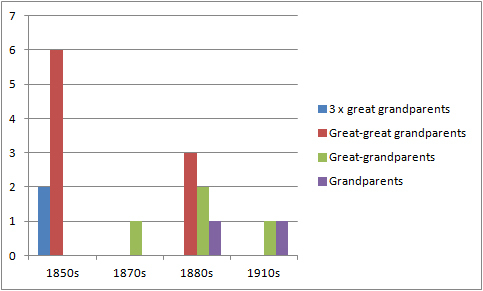 My family stats would be less varied – all NSW, all (as far as I know – there are some mysteries) single. It was fun Frances! All single is a high proportion – I know some were Irish…were they all? No, there were others from Britain as well. Put it like this – I haven’t come across a family emigrating… yet. That’s interesting RebelHand. Singles were very common and women unusually so for emigration theory but that would have been contributed to by the govt’s assisted migration “wish list” for single women and ag labs. When those who were already here started sponsoring their relatives, I’ve seen more families across my Irish study. The family stats can be deceptive because while my Scottish grandmother’s whole family (minus one brother, and deceased father obviously) came out, it was only her elderly mother (oops my age!!) who was sponsored along with a brother who may have been designated as a carer. All the others were assisted immigrants, though they’re hard to find in the archives records. My McSherry/McSharry lot may well have come under railway initiatives. The immediate glance can throw one off with these sorts of records. An interesting task. I am wondering what the ratio of single women was to me? Bad form to comment on your own post, but I have a typo! – ratio of women to men! Ah but not a comment, just a correction Julie 😉 Women:Men ratio: A lot depended on the nationality of the emigrants. Emigration theory says single women are much less likely to emigrate and English women were much more reluctant to migrate to Australia on their own than Irish women. At least with my East Clare database the women are either slightly ahead or evenly balanced with the men. In many cases, they were the initial migrant with chain migration following them. The hidden fact is that they were often accompanied by cousins, siblings (even if not identified as such) or friends and neighbours from the same area….I did a lot of number crunching on this with the East Clare mob. The Australian migration was skewed by govt assistance to bring out single women and men. Lots about this in the migration studies which I find fascinating. Thanks Sandra, I’m glad it gave you some fun…you didn’t add a blog link but would appreciate a peek-a-boo. Personally I’m dodging the house work right now but will have to do it soon! Not Australian, and dinna have Australia Day here in Southern Oregon, but I am interested in your stats. What program or site did you use for your stats? or just regular old excel? Yep, just regular old Excel Joan, with graphs inserted then copied across to Photoshop (may be an easier way but that’s what I do). I found it quite interesting to do this exercise. Looks like a really interesting exercise. Would that I could do one. Not trying to be glum. My first thought was “of course you’d be able to figure this out” then realised you meant it’s yet another “casualty” of having slave ancestors. I’d be glum I think. Well, I guess it’s sort of a back of my mind permanent glum but oh well. You start in the 1850s, I can trace migrations around the USA from that time using census records and where people say they were born. But I can’t go back to before they were here except for dna which is such a broad placement most of the time. I’d imagine so Kristin (re glum). You have census records which we don’t but we have electoral rolls (theoretically compulsory). All swings and roundabouts really. Having to rely on DNA would be annoying given it’s broad parameters. Your post Pauleen has me asking if my singles also arrived in the 1850s. I can immediately think of three who did. 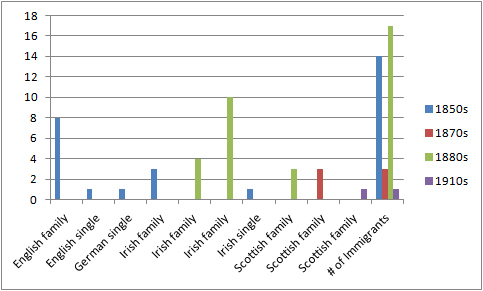 I find the marital status data interesting but also whether they may have travelled with friends/family as many Irish, in particular, did.